BK-Medent Refractory Zirconia Pins are made from a high strength Zirconia that makes them ideal for use with the refractory build-up technique. 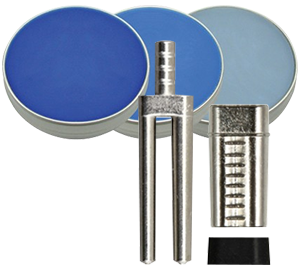 The Refractory Zirconia Pins are smooth and durable, and can be used with any dental refractory porcelain system for an extended number of firings without breaking or distorting. The pins are designed with a round side and a flat side to allow for easy removal from the base, and also to allow them to easily be placed onto the included honeycomb firing tray. After firings are completed dental technicians can easily separate the Refractory Zirconia Pins from the refractory material so they can be reused.